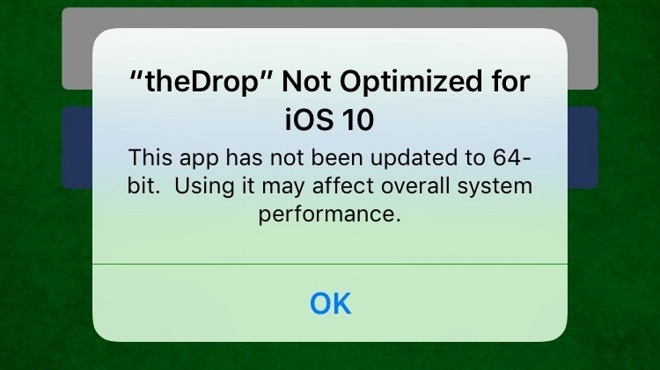 Starting with this week's first developer beta of iOS 10, opening an older application for the first time will present users with a warning message, indicating that the software has not been updated with proper 64-bit support. "Using (this app) may affect overall system performance," the warning reads. Support for 64-bit processors has been required for both new and updated apps since June of 2015. That means any app that displays the warning in iOS 10 has not been updated in over a year. Developers with legacy apps who want to keep their creations working properly have until iOS 10 launches to the public this fall to update. Developers are advised to enable 64-bit in their project by using the default Xcode build setting of "standard architectures," allowing a single binary of both 32- and 64-bit code. Apple was first to bring 64-bit portable computing to the mainstream with the launch of the iPhone 5s in 2013. Every iOS-based device currently sold by Apple now runs a 64-bit processor. Despite the 64-bit requirements now in place, iOS 10 will still run on a trio of devices that do not feature 64-bit processors: The iPhone 5c released in 2013 sports a 32-bit A6 processor, and the iPhone 5 launched in 2012 uses the same CPU, while the fourth-generation iPad features a 32-bit A6X chip.